2 delicious vegetarian meals a day. We do our best to offer local farm fresh and or organic food whenever possible. There is a chai (tea) and free trade coffee stall open at certain times and fresh fruit is always available. We can’t cater to special needs in the food area. Children and adults with special needs get breakfast as well in the kids tent. 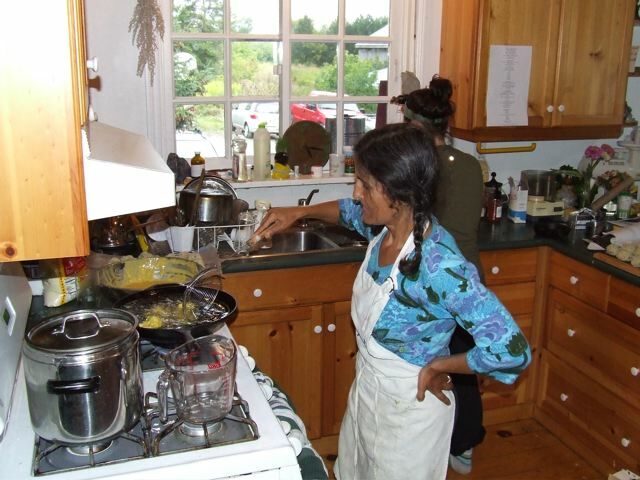 The cooking is a karma yoga event in which people will have the opportunity to help cook and perhaps learn some new wonderful recipes! Traditionally we always have Saturday night as Indian food feast night! We have a fridge you can store small amounts of special food if you need to bring it. Our fridge space is limited. 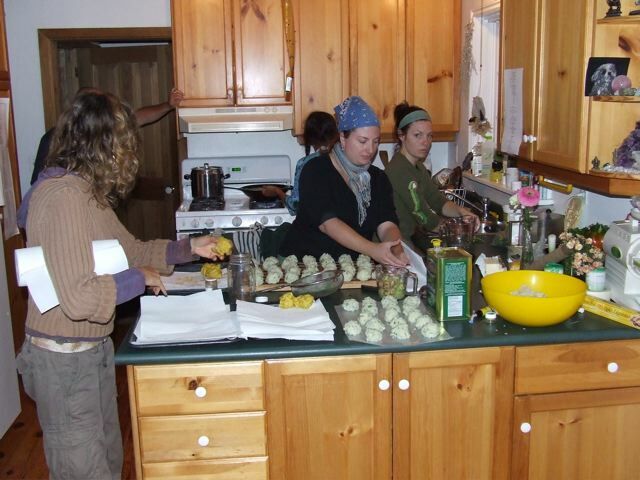 Below we are cooking Potatoe Bonda balls for our annual Indian Feast. Please bring your own mug for tea with your name on it. Or go one step further and bring your own plate, cutlery, mug, bowl etc. Otherwise, we will be doing paper…. There will be a washing station for you to wash your own dishes. You can enjoy the opportunity for karma yoga in which ever manner suits you by signing up for areas where you’d like to assist when you first arrive at the retreat. Examples; Setting up and taking down the retreat, tea stall, wash station, garbage, meal cooking/prep and clean up, children’s area, tidying up tent, storehouse, registration etc.